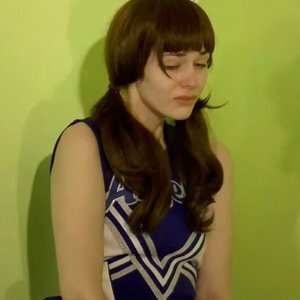 Skylar Rose makes the cutest cheerleader, we are sure you will all agree, but that's where it ends as she is also a mean bully to her team mates. She has been sent home after being punished by her coach and mother is waiting for her after she is told of her latest spanking. Mommy is very upset with Skylar and lectures her further before telling her she is going over her lap for a further spanking which will also be carried out on her bare bottom! Skylar is a stubborn young lady and takes her spanking well, including with the hairbrush which really stings her already sore red bottom!Finally, Skylar is feeling very sorry for herself and promises to be better to her team mates and improve otherwise more spanking are in store for this naughty girl!